This can be achieved by developing in practitioners a healthy mind and body, cultivating a great character, and nurturing talented people and a healthy society, as well as contributing and promoting international understanding. 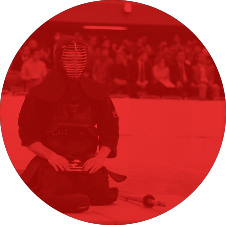 * The All Japan Kendo Federation was an “incorporated foundation” (zaidan hojin), but from April 1, 2012 it changed to “general incorporated foundation” (ippan zaidan hojin) status. * Due to renovation works taking place at the Nippon Budokan, the Kita-no-Maru Office has moved to the same building and floor as the Kudan Office, but in a different room. Phone calls, faxes, and mail will all be forwarded to this location.